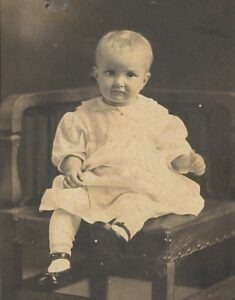 Grace Agre was born on February 28, 1919 to Ben and Clara Salser in Racine, Ohio. The little town with a population of 500 at the time was situated on the Ohio River. (The population in 2010 was only 675.) Racine had fallen on hard times since it had once provided workers for the coal mines that had since shut down. Grace was preceded in birth by Paul, Robert, and Ruth with the four children coming in quick succession in the course of six years. Their home was located in the countryside outside of Racine in a section called Oak Grove. The family lived on a small farm consisting of 120 acres part of which consisted of woodland. Their father provided for the family by working at the central loading station where oil was pumped onto trucks for distribution throughout the area. The farm, however provided the family’s food so there was plenty of work to be done tending to their father’s garden and the animals and with helping their mother with the canning of vegetables she did for the winter. The children were kept busy with chores. From a very early age Grace’s jobs including feeding the chickens. The house had no freezer; food was kept cool in a deep cellar. The house they lived in didn’t have electricity until Grace became a teenager, so light was provided by kerosene lamps. Heat in the winter came from two fireplaces on the first floor. 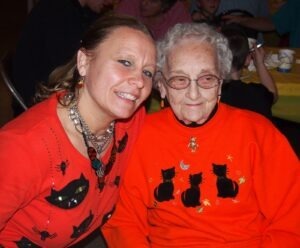 Grace shared a bedroom with her sister Ruth who was two year older. Some times in the winter water would freeze in their bedrooms. Having grown up accustomed to being cold at night to this day Grace sleeps with few blankets. One time when Grace was four years old her brothers were watering their two horses. Grace came up behind a particularly gentle horse and patted it on the leg. The horse, thinking Grace’s touch was a fly instinctively kicked, knocking Grace in the head, fracturing her skull leaving an indention that lasts to this day. A doctor came to the house and prescribed some rest, but before long Grace was back to full activity. Kindergarten in those days was only for rich kids in the city. When Grace turned five she was eligible to enter first grade, but her mother figured she was too young to make the two mile walk down dirt roads to the one room school house and another two miles back, so she waited till Grace was six to send her to school. The one room school house was heated in the winter by a big pot-bellied stove. School let out in late April so that the children could help with the farms. The school house happened to be by the little Methodist Church Grace’s family attended. The pastor who served the bigger Methodist church in Racine also covered three smaller country churches, so the pastor would come to preach at their church only every other week. After four years of schooling all the one room school houses in the areas were closed down and from that point on Grace and her siblings hopped on a school bus that took them to Racine where there was an elementary school and a high school. 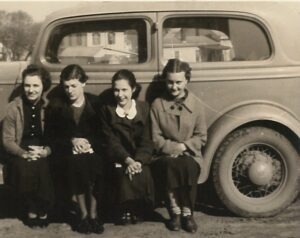 The family never had much money; but things got even tighter when the Great Depression took hold when Grace was ten. Rather than lay off people, the employers at Grace’s father’s companies reduced employees’ hours to part time. Money was tight for most everybody in town. Grace took piano lessons in a class of students. In high school Grace played guard on the girls’ basketball team, following in her footsteps of her sister Ruth who had excelled in the sport. The games were held at night and involved bus trips to other towns. Her father was too busy to attend games and so on game days Grace would stay overnight in town at the home of a friend. l.
On Sunday evenings Grace and her sister Ruth would go into town for “Epworth League”, the name in those days for the Methodist Youth Group at 6:30 p.m. followed by Sunday evening worship at 7:30 p.m.
Grace’s sister Ruth surprised the family by getting married at the young age of 16 during the summer between her junior and senior years. 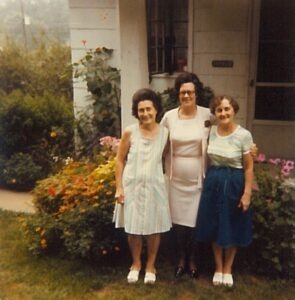 It always puzzled Grace that her sister had married so young – she wasn’t pregnant. Ruth’s husband had an uncle who owned a couple of grocery stores in the area and the newlyweds moved into some rooms adjoining one of the grocery stores where Ruth’s husband worked. Ruth would end up spending her entire life living in Racine. Grace’s oldest brother Paul had mental problems and would continue to live on the farm till years later when his parents could no longer look after him at which point Grace and her brother Robert arranged for him to live in a sheltered home. Robert had left Racine after high school to attend Bible College in Cincinnati becoming a Nazarene preacher, serving churches in Ohio and then later in West Virginia. 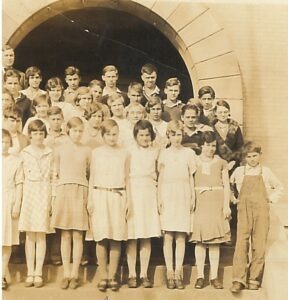 In the Spring of 1937 during Grace’s final year of high school the Ohio River flooded the town of Racine shutting down the school for two months. Nevertheless, Grace managed to graduate on time with her class made up of 55 students. The family did not have the money to send Grace to college, but as a result of her hard work and good grades, she was accepted into a three year nursing program 180 miles away in Cincinnati at Christ Hospital, a hospital started by Methodists. The cost was only $80 a year which covered room and board, a uniform and two pairs of shoes. Grace borrowed the money from her parents, paying them back over time. From the beginning of their first year the nursing students provided staffing for Christ Hospital. The student nurses only had two weeks of vacation, so Grace’s visits home to Racine were few and far between. 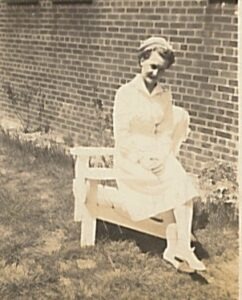 After graduating in 1940 Grace continued working at the hospital in the Maternity Ward for three years. 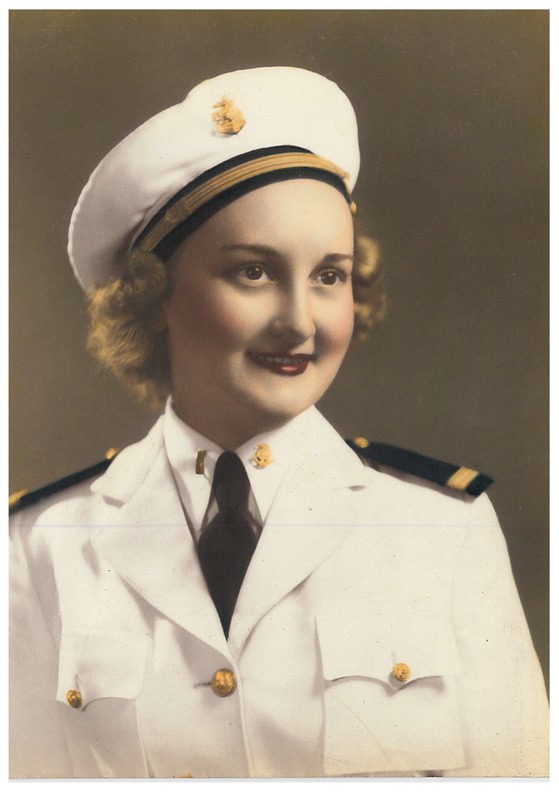 In 1943 the United States entered World War II and with patriotic fervor sweeping the land Grace enlisted to serve her country in the Nursing Naval Corp.
She was stationed in Philadelphia at the Naval Hospital where she served primarily the wives of servicemen. A intense fear gripped our nation in the face of the threat posed by Hitler and the Fascism of both Germany and Japan – a level of fear I don’t think any generation since has known. Grace has a memory that expresses something of the depth of that fear. One night while on duty there was a woman under Grace’s care who suffered from severe anxiety. Grace tried to calm her down as best she could before moving on to tend to the other patients under her care. After a while Grace returned to the woman’s room to discover her missing from her bed. Grace searched everywhere, finally locating her behind curtains and covered with fresh linens. The woman was hiding, she said because she feared that Hitler had won the war. She was convinced he was coming for her. It was during this period of time that Grace met Eli, the man who would become Grace’s husband. Eli was born in Russia in 1908, the fourth of five sons in a family during a time of severe political unrest, the result of which was that his family immigrated to the United States when Eli was only three years old, just six years before the Communist Revolution that toppled the Tsar. Eli’s family settled in the Philadelphia area. Tragically, Eli’s oldest brother died in the world-wide influenza that followed World War I in 1918, killing 50 million worldwide and 675,000 here in the United States. 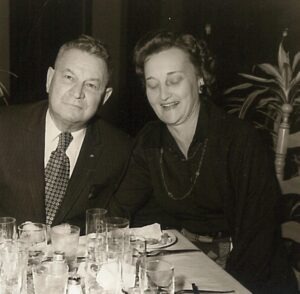 In 1943 Eli was working for a drug company and would often have lunch in the eating place frequented by nurses. At some point they met and soon afterwards began to date. 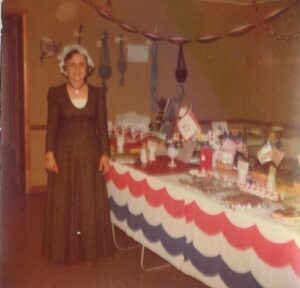 In 1944 however Grace was transferred to the Naval Hospital in Norfolk, Virginia to work there in the maternity ward. With Eli remaining behind in Philadelphia the relationship survived the distance that separated them. Eli came to visit a couple of times. At some point Eli proposed and it came to pass that the man born in Russia and the woman born and raised on a small farm in rural Ohio were joined together in holy wedlock in Norfolk, Virginia by a Navy chaplain on December 17th, 1945 just three months after the end of World War II, and close to the time of Grace’s discharge. The newlyweds settled back in Philadelphia where once again Grace worked in a maternity ward at Presbyterian Hospital in West Philadelphia. At times she would work as a private duty nurse with individual patients who needed special attention. Steven was born in 1947. 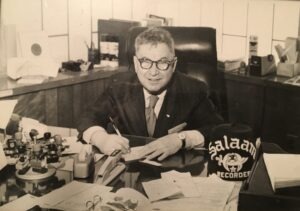 Eli took a job with Sandoz that led to the family moving in 1950 to the house in Morris Plains that they would call home to this day. Barbara was born in 1951. 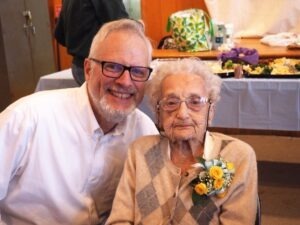 Soon after arriving in Morris Plains, a woman from Welcome Wagon directed Grace to the Parsippany Methodist Church where she began attending. 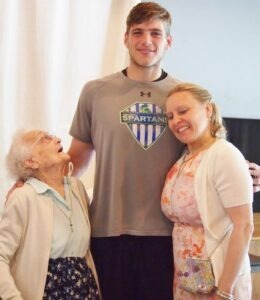 She became a member on November 7th, 1954 which makes Grace presently the church member with the longest running membership, 64 years and counting. This is Grace working at one of the earliest Church Craft Fairs in this building. When Barbara was ten Grace returned to work part time as a nurse at Riverside Hospital in Boonton. Grace stopped working at the hospital when Lynn was born in 1964. 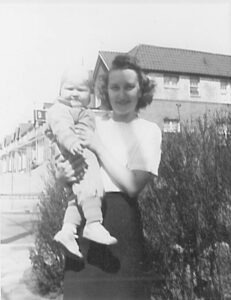 Grace returned to work part time when Barbara was old enough to look after Lynn after school. The hospital was desperate for nurses so Grace could quote her hours. Grace’s parents were country people who didn’t stray far from home, so every summer the family would travel to Ohio for a visit. Ruth had three sons, the youngest of which was close to Steven in age. They would also see Grace’s brother the Nazarene preacher and his family. This is a picture taken in 1977 at the wedding of a friend of Steve’s from Lafayette College in which he was a groomsman. That’s Lynn. Eli’s religious heritage was Judaism, although he did not attend a synagogue. His observance of the faith was limited to Yom Kippur and eating matzo at Passover. Eli’s spirituality found expression through his involvement first with the Masons, and then with the Shriners, becoming the secretary of the Shriner Temple in Livingston. He had a special passion for the work the Shriners did to help sick children, and would on occasion accompany a sick child on a flight to Boston where the Shriners had a hospital. 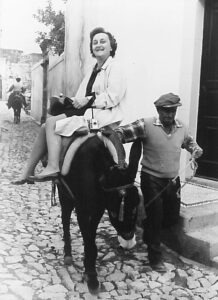 Through the Shriners, Eli and Grace took two trips to Hawaii, and several trips to Europe that included visits to Paris, Berlin and Greece. Eli had suffered a heart attack in 1979 from which he fully recovered. But we know not the hour or the day of our departure from this world. In 1982 Eli was at his desk at the Shriners Temple in Livingston talking on the phone to his friend Ernie, the head of the Shriners when he suffered a massive heart attack. He died before the ambulance could arrive. 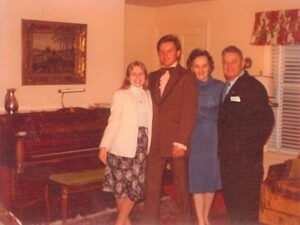 He was 74 years old at the time of his death breaking the heart of Grace, as well as those of Steven, Barbara and Lynn. Lynn was a senior in high school when her father died. In spite of her grief, Lynn went on to graduate from Boston University in 1986. Returning to New Jersey, Lynn became a graduate student eventually completing her Phd, becoming a professor at Rutgers in New Brunswick, Lynn spends weekends with her mother in Morris Plains. 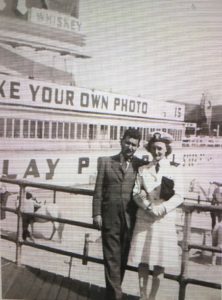 Barbara and her husband Bruno settled in Wayne. 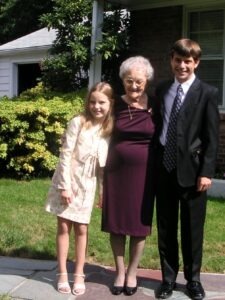 They have two children, Evan and Becky whose arrival into this world brought great joy to their grandmother. After serving as a public defender to those who otherwise could not afford a layer, Bruno became a judge in Passaic County. Evan followed in his father’s footsteps by attending Law school and becoming an attorney. Rebecca graduated from the University of New Hampshire. She presently works at the Passaic courthouse maintaining contact with plaintiffs in upcoming court cases. Steve enjoys writing as well as training young people in the art of boxing. He ran a roofing business for many years before retiring. He lives at home watching over his mother as her mobility and energy has declined having passed one hundred years upon this earth. It has been a special blessing to know grace these past thirty years as her pastor. This is a picture of Grace and Lynn with my son Bobby.